Dormers Wells High School is a Learning Community. We believe it is fundamental to our achieving an ethos of challenge and support that we project the whole school as a learning community. We believe, as a community of learners, we have a fundamental duty to ensure everyone associated with the school sees themselves as a lifelong learner. 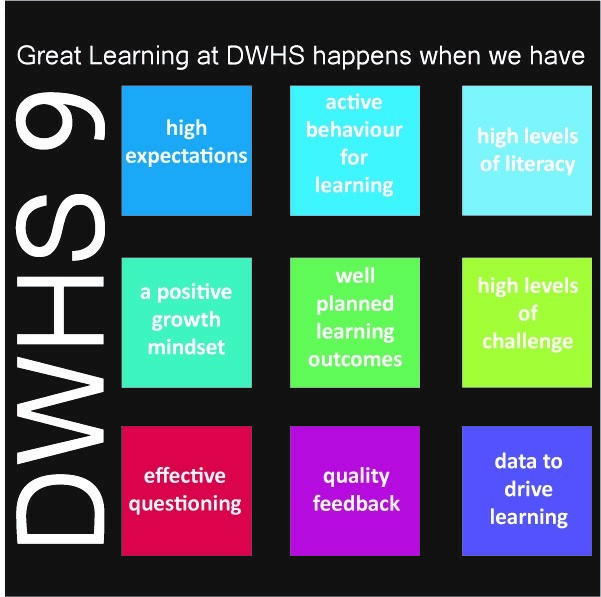 Learning and teaching at Dormers Wells High School is a core focus and with this as our key driver we have developed the Dormers 9 which represents the essential aspects of great learning for our students. These aspects of “Great Learning” are regularly shared with our students and our own professional development as staff focuses on them to ensure they are embedded within our practice. High expectations – we are highly aspirational with all our students ensuring they work and aspire to outstanding levels in their learning, extracurricular participation and future aspirations. Active behaviour for learning – we encourage and facilitate all our students to develop both in and out of lessons outstanding positive behaviour for learning where they take responsibility for actively engaging in the learning process. High levels of literacy – we place great focus on supporting our students to develop their literacy across the curriculum by ensuring that each student receives personalised feedback which includes development of their oracy and written work to encourage the highest standards. A positive growth mindset – we develop a positive growth mindset with all our students so that they become resilient learners and can face challenges with confidence. Well planned learning outcomes – we always share our challenging learning outcomes with our students. Throughout the lesson students’ progress is regularly reviewed against the outcomes and teaching adapted to ensure any misconceptions are tackled to ensure progress within lessons and over time.